The Tenth Doctor, David Tennant is back for his very last audio reading Dead Air, written exclusively for BBC Audiobooks by James Goss. The audio adventure is available now priced at £8.99. Other Tenth Doctor audios include Pest Control, The Forever Trap, The Nemonite Invasion, The Rising Night, The Day of the Troll and The Last Voyage. "Hello, I'm the Doctor. And, if you can hear this, then one of us is going to die." 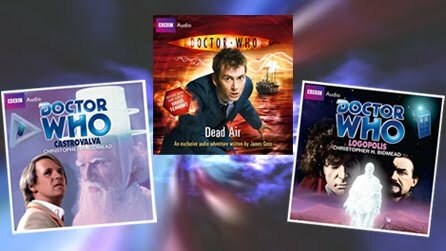 Written specially for audio by James Goss and read by David Tennant, Dead Air features the Doctor as played by David Tennant in the acclaimed hit series from BBC Television. In theory the TARDIS should be able to change its appearance to blend in unobtrusively wherever it happens to materialise. In practice, however, because of a fault in the chameleon circuit, it always looks like a police box – a minor inconvenience the Doctor hopes to correct. Christopher H. Bidmead reads his own thrilling novelisation of the last adventure for the Fourth Doctor. Still weak and confused after his fourth regeneration, the Doctor retreats to Castrovalva to recuperate. But Castrovalva is not the haven of peace and tranquility the Doctor and his companions are seeking. Far from being able to rest quietly, the unsuspecting time-travellers are caught up once again in the evil machinations of the Master. Only an act of supreme self-sacrifice will enable them to escape the maniacal lunacy of the renegade Time Lord. Peter Davison reads Christopher H. Bidmead's complete and unabridged novelisation, first published by Target Books in 1983.